Magic Toast is rolled with a Honduran cover leaf and contains a double binder from Nicaragua and Honduras. The filler leaves too, hail from both countries. Alec Bradley Cigar Co. recently announced they were bringing a new cigar to the International Premium Cigar & Pipe Retailers trade show—but the company wouldn’t reveal its name until the first day of the show. 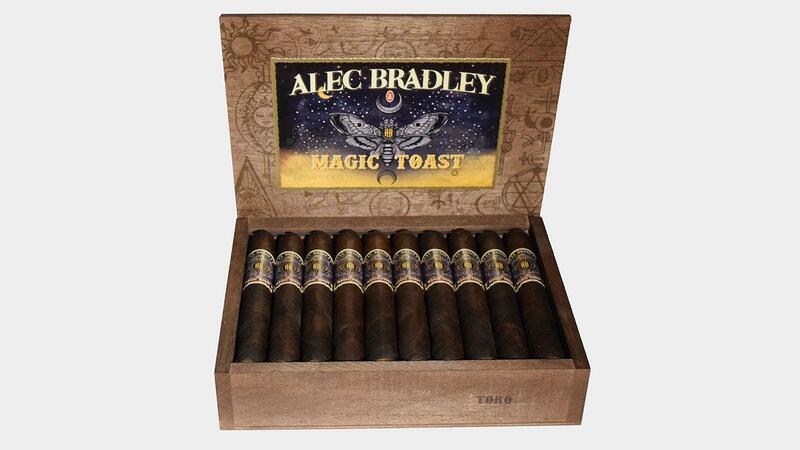 Now curious cigar retailers can finally catch a glimpse of the mystery cigar, unveiled today as Magic Toast. Magic Toast is rolled at Fabrica de Tabacos Raices Cubanas S. de R.L. in Danlí, Honduras. Magic Toast is rolled with a Honduran cover leaf and contains a double binder from Nicaragua and Honduras. The filler leaves, too, hail from both countries. The new brand comes in three sizes: Robusto, at 5 inches by 52 ring gauge ($8.95); Toro, at 6 by 52 ($9.50); and Gordo, 6 by 60 ($10.25). The cigars are rolled at Fabrica de Tabacos Raices Cubanas S. de R.L., in Danlí, Honduras.